Draugen was the first field to begin production on the Halten Bank in the Norwegian Sea. Its oil could be loaded into shuttle tankers and shipped to refineries, but finding a commercial solution for the gas was less simple. No export infrastructure for gas was immediately available. Shell’s proposal to flare the gas in situ was rejected by the government on resource management and environmental grounds. Injecting the gas into Husmus, a satellite reservoir, offered a temporary solution. This was permitted for six years while a permanent export system was put in place. [REMOVE]Fotnote: Norsk Oljerevy, no 11, 1993, “Draugen-prosjektet vekket Midt-Norge”. Through the Haltenpipe from the shelf to Tjeldbergodden. Problems with gas were not confined to Shell and Draugen. After exploration drilling was permitted above the 62nd parallel (the northern limit of the North Sea) in 1980, a number of discoveries were made on the Halten Bank. Saga Petroleum found gas in the Midgard field in 1981 with its third well in the area, while Statoil and Shell discovered Smørbukk and Draugen respectively in 1984. Statoil then proved Smørbukk South in 1985, when Conoco also found Heidrun. And Norsk Hydro discovered the Njord field the following year. Success on the Halten Bank accordingly came quickly. All three Norwegian oil companies and international operators Shell and Conoco became involved in development assignments there. Several of these fields contained natural gas in addition to oil, and opportunities for shared pipelines to bring this ashore were discussed on several occasions. Heidrun’s gas reserves were larger than those in Draugen, and flaring these was again excluded by Norwegian emission standards. Nor was injection relevant. Since no gas transport network existed this far north, Statoil and operator Conoco resolved to lay the Haltenpipe gas line to Tjeldbergodden and to build a methanol plant there. As the state oil company, Statoil was particularly concerned to meet the political goal that Norway’s petroleum production should create spin-offs and jobs on land. Haltenpipe would pass within a few kilometres of Draugen, so a gas tie-in from that field seemed sensible. Statoil/Conoco therefore proposed that the Draugen partners should become co-owners of both pipeline and methanol plant. Negotiations were pursued in 1992 between Shell/BP for Draugen and the methanol group on delivering gas to Tjeldbergodden. But the former felt the methanol project was too expensive. Nor were they interested in producing this chemical. They offered their gas free of charge, but Statoil/Conoco declined. [REMOVE]Fotnote: Lerøen, Bjørn Vidar (2012): Energi til å bygge et land. Norske Shell gjennom 100 år, 177–78. The negotiations accordingly foundered, and Haltenpipe passed Draugen without a tie-in. As noted above, permission to inject Draugen gas in Husmus was limited in duration. Offshore could announce in March 1998 that Norske Shell had finally found a buyer for the gas. Development of fields and transport solutions from the Norwegian Sea had now made several strides. In connection with its Åsgard development, Statoil was planning a new gas pipeline to Kårstø north of Stavanger. This would pass within 78 kilometres of Draugen and laying a spur from that field to a T-joint on the Åsgard line would allow its gas to be sent to Kårstø. There it could be processed and transported on to consumers in continental Europe. [REMOVE]Fotnote: Offshore, 1 March 1998, “Offshore Europe”. This solution was fully in line with what Shell wanted. A plan for installation and operation (PIO) of a pipeline to link Draugen with the Åsgard Transport system was submitted to the Ministry of Petroleum and Energy in May 1999. In the consultation process on this Draugen Gas Export facility, politicians in Møre og Romsdal county council expressed some dissatisfaction. They wanted clarification of the regional spin-offs from this project, and called for measures to secure more work for mid-Norwegian players in all new Norwegian Sea developments. [REMOVE]Fotnote: Møre og Romsdal county executive board, 16 September 1999, item U-162/99 A: Konsekvensutgreiing for Draugen Gasseksport. That demand fell on stony ground. The priority was to ensure that Norwegian Sea gas reached the market, and calls for local jobs took second place. The PIO was approved in April 2000. Draugen Gas Export became operational in November 2000. [REMOVE]Fotnote: Norwegian Petroleum Directorate, 1 October 2007: Helhetlig forvaltningsplan for Norskehavet. Statusbeskrivelse for petroleumsvirksomhet i Norskehavet. Its diameter of 16 inches offered opportunities to tie in several other discoveries in the area. Once the pipeline was in place, therefore, surplus gas was no longer a challenge for Draugen and new satellite fields were developed. The Garn West discovery came on stream in December 2001, while Rogn South was approved in the spring of 2001 and began production in January 2003. [REMOVE]Fotnote: Norwegian Petroleum Directorate, 1 October 2007: Helhetlig forvaltningsplan for Norskehavet. Statusbeskrivelse for petroleumsvirksomhet i Norskehavet. Statoil was accustomed to taking a leading role in the development of the pipeline network on Norway’s continental shelf (NCS), and did so again when the Norwegian Sea-North Sea link was realised. Growing demand for gas in continental Europe made it possible. The Midgard discovery operated by Saga and the Statoil-operated Smørbukk/Smørbukk South finds were unitised in 1995 to create a new licensee structure with Statoil in the driving seat. Renamed Åsgard, this area became the subject of the biggest single development on NCS, which made extensive use of increasingly tested and reliable subsea technology. An oil production ship, Åsgard A, and the floating Åsgard B gas/condensate platform were tied to 63 subsea-completed production and injection wells split between 19 seabed templates. The gas/condensate satellites Mikkel and Yttergryta were also tied back to Åsgard B through seabed templates and associated flowlines. With water depths of 240-310 metres across the area, plans called for oil from Åsgard A to be shipped ashore by shuttle tankers. The big reserves discovered in the Norwegian Sea created the basis for tying this area to Norway’s existing gas transport system in the North Sea. Operational in 2000, the 42-inch Åsgard Transport pipeline is 707 kilometres long from a starting point on the seabed beneath Åsgard B to the Kårstø processing plant. Gassco is the operator of this system today, with Statoil as the technical service provider. Åsgard Transport can carry 25 billion cubic metres of gas per annum. 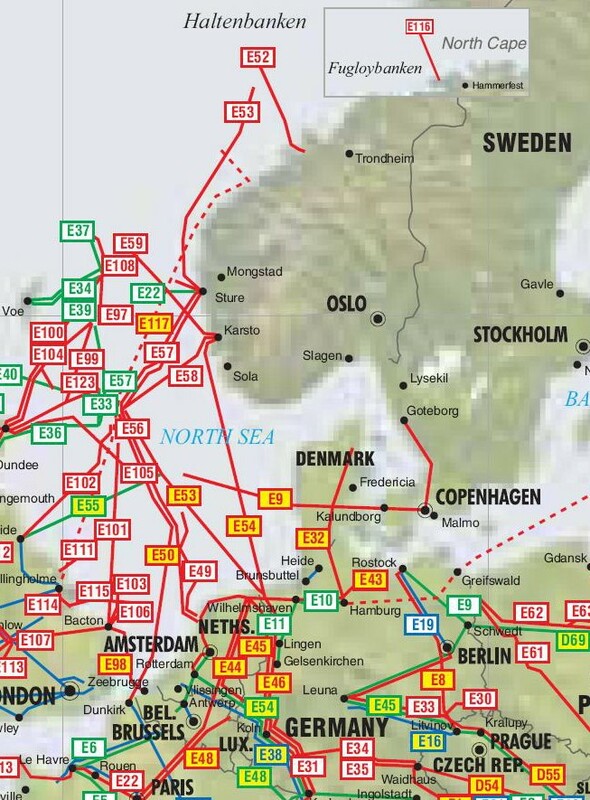 All the fields in the Norwegian Sea except Ormen Lange and Heidrun (part) export their gas through the pipeline. In addition to Åsgard, that includes Statoil-operated Njord, Heidrun (part), Kristin and Norne, BP-operated Skarv, and Draugen. The Njord oil field lies due west of Draugen and came on stream in 1997. Associated gas was initially injected in parts of the reservoir to maintain its pressure. 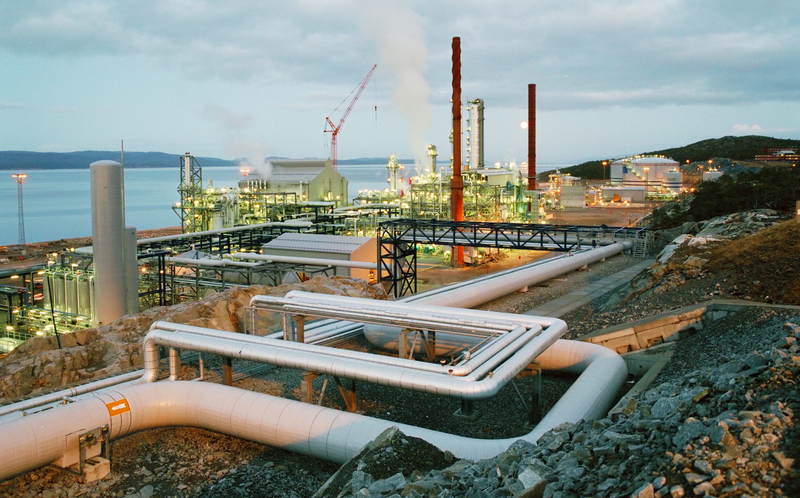 Gas exports began from Njord in 2007, reducing the quantity available for injection. The gas travels through the 40-kilometre Njord export pipeline, which is tied into Åsgard Transport. Heidrun, on stream since 1993, still sends the bulk of its associated gas to Tjeldbergodden. Opening Åsgard Transport also made it possible to transport part of the gas to Kårstø, but little use is made of this opportunity. Like Njord, the Norne oil field came on stream in 1997 and its associated gas was injected as pressure support until 2005. Part of the gas was exported via Åsgard Transport from 2001, and all this output from 2005 when gas injection ceased. The Alve gas/condensate and Urd oil fields pipe their production to Norne for processing and onward transport. Kristin is a gas/condensate field just to the south-west of Åsgard, which came on stream with a tie-in to Åsgard Transport in 2005. The seabed installations on Draugen were developed by the subsea department of Kongsberg Våpenfabrikk (KV, later Kongsberg Offshore (KOS) and FMC), aided by an R&D collaboration with Shell. This cooperation was successful for both sides. Shell saved money through intelligent solutions, while Kongsberg’s subsea team was able to demonstrate its capability to an international company. Amplified by Shell’s big network of contacts, that proved a springboard into becoming a substantial exporter of subsea technology. 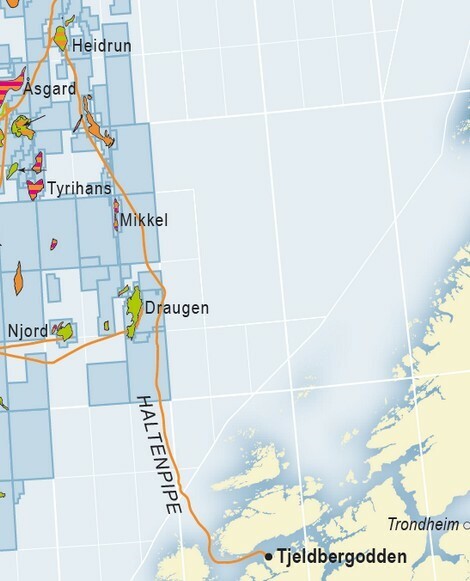 Draugen was the first field developed on the Norwegian continental shelf (NCS) above the 62nd parallel. There was no infrastructure for export of oil or gas from the area. That created some challenges.